Losing a loved one is always painful. But time can be a great healer, and help you enjoy and remember the good times you shared. We received this touching mail last week so wanted to share it here. Ive been meaning to send some photos to you for ages and ages but things get so hectic and before you know it the months have flown by. 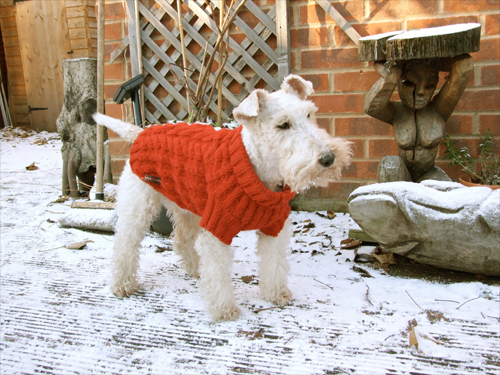 I bought Pippa a red Wilmot jumper a couple of years ago just in time for the snowy weather. She really appreciated it I can tell you and she looked so beautiful and warm. Also being brightly coloured meant i could see her when she would have a mad moment and run quite a distance in our local park! Unfortunately she died of pancreatitis in August 2011 aged 12 but i would really love you to put her picture in your gallery. Im sure that you would agree that this jumper really suited her. Myself and partner will be getting another fox terrier and also a welsh terrier and so will be in touch again I’m sure to buy more Wilmot jumpers as being by the coast they will definitely need jumpers! So thank you for your letter Lorretta. We look forward to seeing some photos of your new terriers after your move to Brighton.